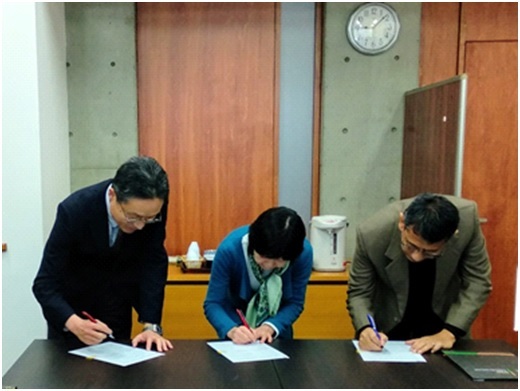 Monday, February 25, 2019, at CSEAS Yoshida Campus Kyoto University, UI School of Environmental Sciences (SIL UI), Graduate School of Asian and African Areas Studies (ASAFAS), and Kyoto University’s Center for Southeast Asian Studies (CSEAS) Signing the Agreement of Implementation for Academic Cooperation for a period of 5 years. The signing was carried out by the Director of SIL UI, Dr. Emil Budianto, Dean ASAFAS Professor Yoshifumi Tamada, Ph.D, Head of CSEAS Prof. Hayami Yoko. The signing was witnessed by academics from SIL UI, ASAFAS, CSEAS, and the Graduate School of Global Environmental Studies (GSGES). Present from SIL UI the lecturers: Dr. Tri Budhi Soesilo, Dr. Setyo S Moersidik, Dr. Hayati Sari, Raldi Hendro Koestoer, Ph.D, Dr. Ahayhudin Sodri. Alumni and Students: Dr. Denny Sundara, Dr. Januar Purnama, Dr. Ellyna Chaerani, Retno Setiowati, and Lydia Simanjuntak. The agreement with ASAFAS has a mission to organize multidisciplinary education and research programs that explore the relationship between ecology, society and economics in the Asia and Africa region. ASAFAS consists of 3 divisions, namely: (1) Division of the Southeast Asian Area Studies; (2) Division of African Area Studies, and (3) Division of Global Area Studies. The ASAFAS curriculum is a 5-year Doctoral Program. First year: studying fundamental area studies and fieldwork. Second year: writing pre-doctoral thesis (equivalent to master’s thesis). Third year: continue fieldwork. Fourth year: presentations at international and domestic conferences. Fifth year: academic exchange agreement. CSEAS is a multidisciplinary research center. The scope of research includes: humanities, social sciences, and natural sciences. The research division at CSEAS includes: (1) Cross-regional Studies; (2) Political and Economic Coexistence; (3) Social Co-existence; (4) Environmental Co-existence; and (5) Global Humanosphere.